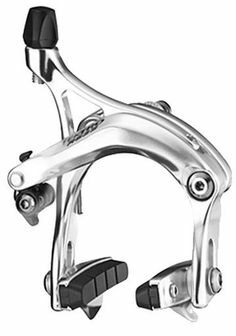 I noticed one day when riding the bike after maybe not riding it for a week or so that the rear brake had become extremely strong . Even lightly pulling on the lever meant the wheel instantly locked up and skidded and I could feel a grinding coming up out of the frame through the saddle . I undid and redid the cable , played with the tension and checked the brake pads for wear and alignment , all seems good , pads have a good bit to go before replacement . The best I have managed is to screw in the barrel adjuster on the brake very far so that the lever is very soft and needs to be pressed in almost to the bar to engage the brakes , even then its much stronger than it was before . So now I have a firm feeling front lever and a very soggy rear lever where before a week ago they were both similar in firmness. What gives ? Has my hand suddenly become much stronger or my brake pads are just now revealing new strengths ? Hard to say without seeing your bike. Where do the brake pads actually contact your rim? Might one of the pads be contacting the tire? If that's the case, you'll find out shortly because you are going to have a rear tire blow out. Or perhaps the opposite, your pads are too low and have developed a lip on the bottom which catches under the rim shoulder, although generally this manifests itself with a brake which will not readily release after being applied. You might also check your pads to ensure that there are not metal shards embedded in them, which might account for the grinding feeling. I'd also check the condition of the rim. Any flat spots or dents can create locations where the rim's width has changed, This then becomes a point of brake function changing, sometimes as a grabbiness as the widened rim location tries to slide through the brake pads. If the caliper pivots have loosened up the resulting arm slop can cause the caliper's pressure against the rim to change quickly and as the arms/pads shift/rotate about the pressure against the rim can increase rapidly. The last rim aspect to look at is if the brake track has become contaminated. Pads can wear off and the residue adhere to the rim, road crap can cover the rim as can oil from the chain. Andy. Have you cleaned the rims in case some substance got "splashed" on the brake track? In control theory terms, you have positive feedback. You brake, and something in your bike system is causing feedback that amplifies your braking force, leading to lockup. Perhaps this is obvious, but make sure your brake calipers are securely fastened to the frame (tighten the nut), and the same for your brake pad holders. Make sure that brake pads are the right size and are securely fastened to the brake pad holder. If any of these things are loose, braking could cause them to move and cause a wedging action, leading to the positive feedback. Another thing is your cable and the routing of your cable. The mushiness hints at this. First, you should be very careful to ensure that you are using helical BRAKE cable for your rear brake, and not compressionless index compatible derailler cable housing (see Cables). If someone, at some time, installed the compressionless stuff on your brakes, it may have broken down (which is why you get a mushy feel). In that case, when you pull the brake lever and the brake caliper flexes and pulls the cable you get the housing stretching, which increases the braking force. Alternately, the brake cable has been routed too tightly somewhere and the brake actuation is causing the cable to stretch and to brake more. Or, if the cable in your bike is routed internally, it may be interacting with other cables. I doubt this though. Last, if the cable in your bike is routed internally or between stops on the frame, you may have a crack in your frame or a loose stop. You brake, the bike flexes at the crack, causing more force on the brake cable leading to the positive feedback. I suppose it could be the brifter/brake lever. Check for internal cracks. Some ideas anyway. Given the mushiness, I suspect cable housing breakdown, or a frame issue, or the cable being routed too tightly. Last edited by WizardOfBoz; 01-28-17 at 03:57 PM. Off topic but years ago I recall driving a van with a broken motor mount. If you went up a hill in a low gear the motor would twist in a way that would apply more throttle and more twist until full throttle was applied. Jambon, did you figure out what was going on? My mother told my dad that he symptom had occurred to her, and my dad said she was crazy. So, we all piled into it to go out for dinner. When my dad gave it the juice,the engine rocked over, the pedal went to the floor, and it flat took off! Scared the heck out of all of us! What is this? Cassette or Freewheel?